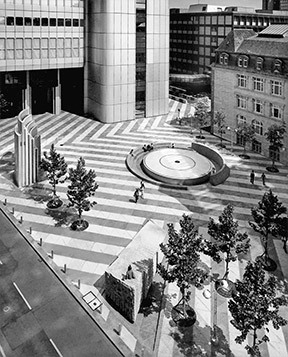 Numerous monumental sculptures and large-sized mosaics, wall paintings, large-dimensioned metal-reliefs and kinetic works of Heinz Mack can be found in urban squares, parks, corporate headquarters, government ministries, and in various cultural or other institutions. 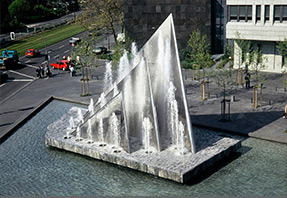 The "Jürgen-Ponto-Platz" in Frankfurt and the "Platz der Deutschen Einheit" in Düsseldorf are central artistic examples for this. 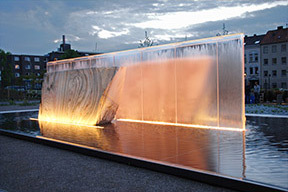 For extensive compositions of public spaces Mack often works with spectacular light- and/or water elements making the spaces gain more strength and energy. 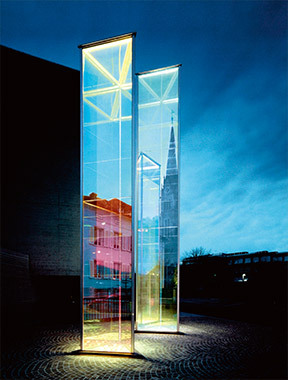 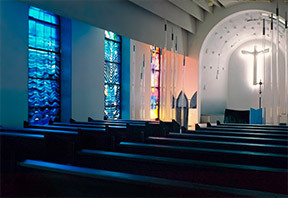 Heinz Mack has also designed sacred spaces as total works of art, such as the chapel in the Archiepiscopal Collegium Marianum in Neuss, the chapel St. Elisabeth in Mettmann and the St. Theresia church in Kaiserslautern.